Kids won’t ever stop growing, so why not make a bike that can? offer customers value for money with our long lasting, high quality adaptable kids bike which, uniquely, grows with your child. give children with the means to develop their cycling skills safely so they can ride without assistance earlier than normal, thus getting the most out of their cycling experience. reduce material consumption by replacing the multiple kids bikes that would traditionally be bought, used, then discarded. ensure 100% customer satisfaction with our long term warranty, money back guarantee and personal customer service. 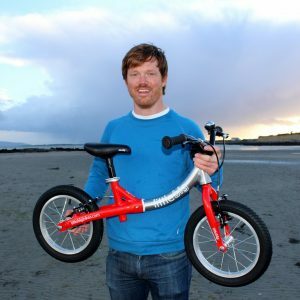 Simon Evans – round the World cyclist – founded LittleBig in Ireland in 2014. Simon was one half of Revolution Cycle, the two-person team who, in 2010, completed the first Irish circumnavigation of the globe by bicycle. This epic adventure covered 30,000km through some some of the highest, driest, remotest, wettest, and hottest places on earth. It affirmed Simon’s love not only for bicycles, but for the freedom they afford for travel, exploration, fitness and mental health. Simon is also an engineer. His talent for creating elegant, real-world solutions through careful design and detailing led to early roles as a structural consultant. Simon helped develop ultra modern edifices and restore ancient historic buildings. These experiences in sustainable design, allied with his wealth of bicycle knowledge, propelled him to design and develop the LittleBig adaptable children’s bike. After completing Revolution Cycle, I was working as a mechanic and sales person at a bike shop in Greystones. It was there that I came across balance bikes and saw how quickly kids were comfortable on them. Often small kids would just jump onto a balance bike without any assistance and start zooming around the shop, it just seemed so natural for them. However normal balance bikes are very small and kids quickly grow out of them. On top of that, when the child is ready to begin pedalling, the parents needed to come back and buy a new bike. I thought to myself, kids won’t ever stop growing, so why not make a bike that can? Being an engineer, my creative mind began churning out ideas and a few designs later, the LittleBig was born.